COMPANY PROFILE Callon Petroleum Co is engaged in the exploration, development, acquisition, and production of oil and natural gas properties. The company generates its revenue from the sale of Oil. Callon Petroleum Company engages in exploration, development, acquisition, and production of oil and natural gas. Activities are primarily conducted in the Permian Basin region of the west Texas and southeastern New Mexico. Callon relies heavily on the latest horizontal production techniques to extract hydrocarbon products from its assets, with crude oil accounting for over half of production. Historically, a handful of marketing and trading companies have accounted for the majority of the sales for Callon’s oil and gas production. Assets are acquired through drilling of emerging zones on existing acreage but also by acquiring additional locations through leasehold purchases, leasing programs, joint ventures, and asset swaps. 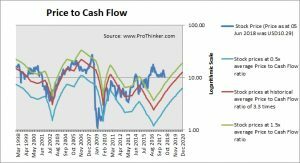 At the price of USD10.29 as at 05 Jun 2018, Callon Petroleum Co is trading at a Price to Cash Flow Ratio of 6.9 times last 12 months cash flow. 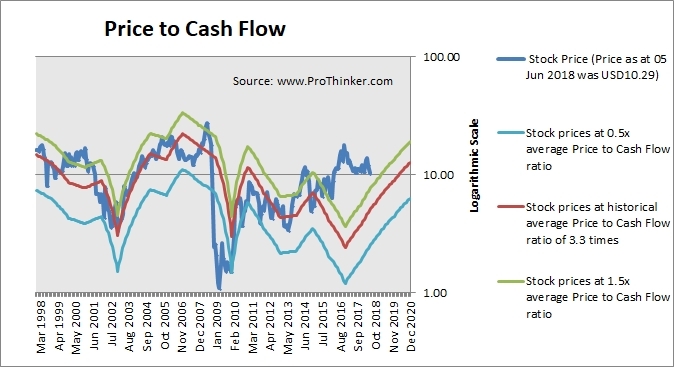 This is a 108.0% premium to its historical average Price to Cash Flow Ratio of 3.3 times.